Replacing windows and exterior doors requires a permit. All commercial and industrial projects require a building permit. All construction must be done by a contractor licensed to do work in the Village of Montgomery. Residents should check with the Village to be sure a contractor is licensed before signing any contracts for work. 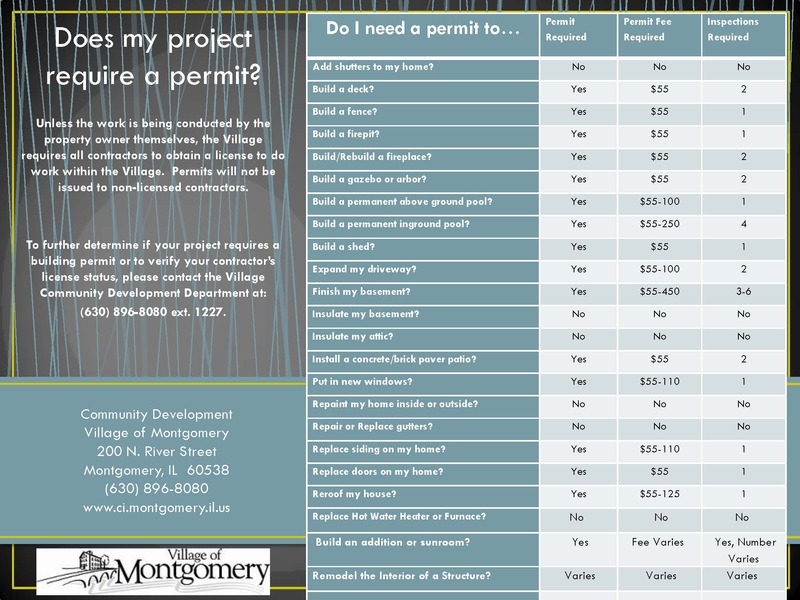 A permit must be obtained before work can begin on any of the above projects. Please be aware that any project that involves digging into the ground (such as fences, patios, additions, etc.) will require a JULIE Dig Number, please call 811 or 1-800-892-0123, to locate underground utilities, which must be done before a permit will be issued. A Building Permit Application may be printed and completed, then brought to the Building Department for approval. The cost of a building permit varies according to the project. For more information or to schedule an inspection, please contact the Building Division at (630) 896-8080 ext. 9023.